There is no excuse. There is no plausible explanation. And there is no way that Joe Mixon should play with his team in the upcoming Sugar Bowl game against Auburn. Oklahoma Coach Bob Stoops made his first public comments about a 2014 surveillance tape that shows running back Joe Mixon punching a female student and, if anything, his words revealed that when it comes to violent incidents, colleges are still trying to figure it out. Especially when the athlete involved is a star and, as the NFL found out in the Ray Rice case, awful video of a woman being slugged exists. “Two and a half years ago, [I] thought we had a significant penalty, a strong penalty,” Stoops said at a news conference Wednesday, defending the one-season suspension he gave Mixon. “Now, it isn’t enough. These individuals can’t have a second chance. Just not acceptable. And they know it anymore, and they’ve been told enough. We have more meetings and things of that nature that instruct and let them know what appropriate behavior is and isn’t and what the consequences are. In the 2014 incident in an off-campus restaurant, Mixon struck fellow student Amelia Molitor in the face, breaking four bones. Three days later, he told police in Norman, Okla., that he simply was reacting to both a racial slur uttered by one of Molitor’s companions and what he described as a hard swing Molitor took at him. Mixon, in video footage of a police interview published by the Oklahoman, said he felt as if “a dude hit me” and reacted. 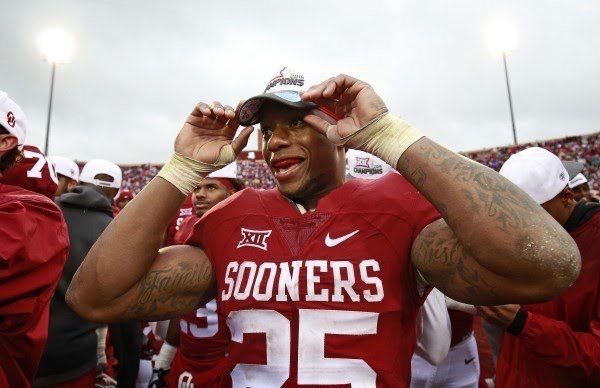 “The gay dude … he called me something,” Mixon said in the video. “He was like [slur]. So then I was like, you got me messed up. And then I called him a [slur]. And after that, the girl, she dropped her purse, that’s when she came in my face, pushed me, and then my glasses came off, and then, like, I had, like, jumped at her, like, to watch out. And then she came in my face. I put my head down. And she swung on me. The surveillance video was released by Mixon’s attorneys at his request last week. Mixon is shown from two camera angles on that July 2014 day approaching Molitor at a table at Pickleman’s restaurant. They exchange words and Molitor pushes Mixon, then slaps his neck. Mixon punches Molitor, whose head strikes the table as she falls to the floor. Mixon, who apologized last month, was charged with a misdemeanor but agreed to an Alford plea, receiving one year of probation with cognitive-behavior counseling and 100 hours of community service. Molitor sued him for negligence, willful and wanton misconduct and intentional infliction of emotional distress, but the first two claims were thrown out by a judge last month. The latter claim remains active. Stoops told reporters that he did not think it would take so long for the video to be released and the city of Norman was forced to do so after the Oklahoma Supreme Court ruled in favor of the Oklahoma Association of Broadcasters, who had filed a complaint under the state’s Open Records Act. The city had until Dec. 26 to release the video or file an appeal and Mixon’s attorneys took a preemptive step last week, with Molitor’s civil suit still pending. In his only interview with members of the media at Oklahoma, Mixon has declined to answer questions about the incident.